Built around the concept of pan-Arabism, the Hashemite Kingdom of Jordan is located in the heart of the Arab world. Since its establishment, it has become a model of moderation and an evolving democracy in the region. Jordan is based on a modern, progressive Constitution and its governing system is a hereditary, parliamentary monarchy. Its people are like a family, where diverse components of different religions, languages and ethnicities have come together in a melting pot to become one Jordanian family, rendering the Kingdom unique in its unity, diversity and stability. 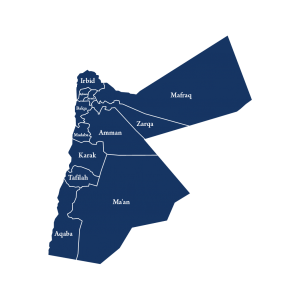 Jordan is divided into 12 governorates: Amman (the capital), Irbid, Zarqa, Mafraq, Ajloun, Jerash, Madaba, Balqa, Karak, Tafileh, Maan and Aqaba. Each governorate encompasses a number of districts and sub-districts. According to the Department of Statistics’ data from its 2015 census, Jordan’s population is around 9,531,712 people. Jordan’s area is 89,213 square kilometres, and it shares borders with five states: the Kingdom of Saudi Arabia from the south, the Syrian Arab Republic from the north, the Republic of Iraq from the east and the occupied Palestinian territories from the west, in addition to the maritime border it shares with Egypt in the Gulf of Aqaba. Jordan is located geographically between the 33° and 29°N latitude lines, and 39° and 34°E longitude lines, giving the country a moderate desert climate. Jordan’s land is arid and semi-arid, with a long summer, short winter and little rainfall. The port of Aqaba is Jordan’s only sea access. It overlooks the Red Sea, with the Kingdom’s share of the coast being a 25-kilometre-long shore.